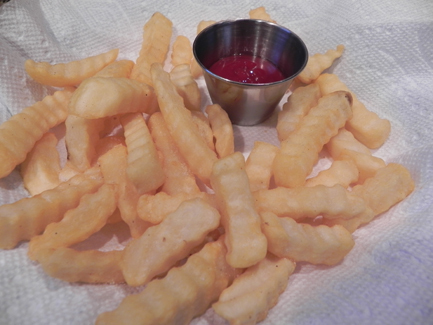 This is probably one of the first items most people cook in their new Airfryer - frozen french fries. Cook frozen french fries at 350 degrees for 15 minutes. After about 11 minutes they will look and smell done. But taste a long french fry because it will probably be chewy inside and need to cook for about 4 more minutes. One problem with frozen french fries is that they are not all the same size. One of the secrets to cooking evenly in an Airfryer is to keep everything you are cooking about the same size. So test a large french fry. It doesn't hurt the smaller french fries to continue cooking until the large ones are done. *NOTE: No need to thaw the frozen french fries. *I use a Philips Airfryer in all my Airfryer recipes. PREHEAT Airfryer to 350 degrees F for 1 minute. 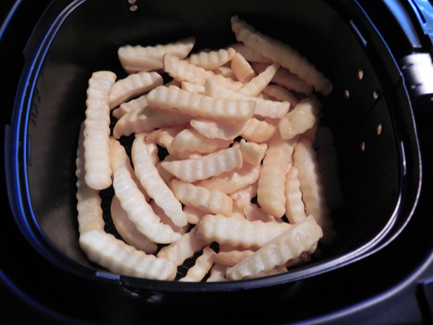 Add a layer of french fries to the Airfryer. Cook at 350 degrees F for 15 minutes.